Going for a spin on the A and B roads which traverse the Scottish countryside is one of the highlights of motorcycling in Scotland. However, despite the thrill of riding on a twisty, quiet rural road, these byways can be hazardous – slow moving cars, tractors traveling between fields, sheep suddenly appearing in the middle of the carriageway, mud on the road, meeting road users going in the opposite direction on your side of the road. Grampian Police have provided some useful information as part of Operation Zenith which can be downloaded here. 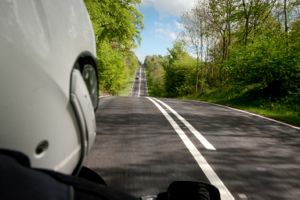 If you are involved in an accident on a rural road, you should seek professional advice from an experienced motorcycle law expert to ensure you receive the justice you deserve. To find out how the Courts have approached cases involving accidents on rural roads, please have a look at the decisions below. Remember, no two cases are the same: your case is unique, the accident circumstances are unique and each case is fact sensitive.